One bold, unique and eye-catching element of design may be just enough to define the interior of a commercial space and turn it into a veritable public attraction. 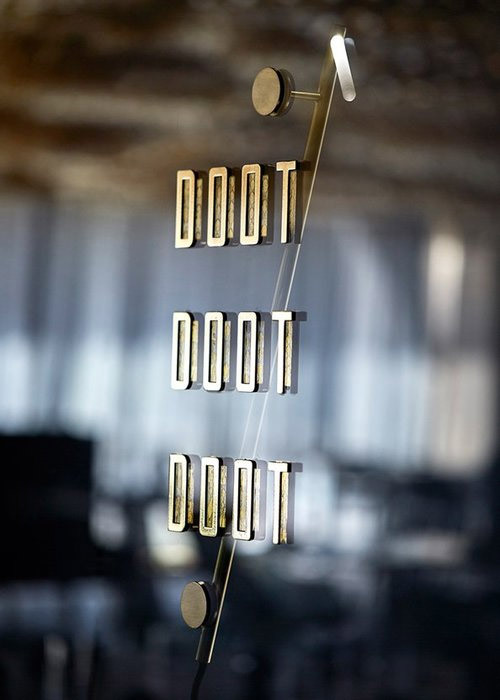 Melbourne’s Doot Doot Doot restaurant located in the trendy Willow Creek Vineyard development on Mornington Peninsula finds its voice and character by flaunting an immense 10,000-globe chandelier that spans across the whole length and width of the restaurant ceiling. Created by Fabio Ongarato Design, this lighting masterpiece replaces the typical singular fixtures of insular placement with a vast landscape of light. The globes vary in dimensions and height, creating an uneven surface with a unique texture. But while the amount and beauty of glass in this atypical ceiling would be enough to grab the attention, the idea behind this abundance of light is even more daring. 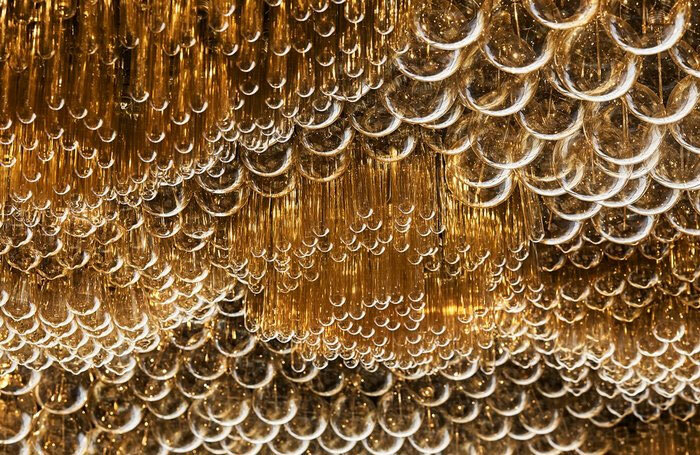 The 10,000 lights turn on and off in a light show that calls to mind the process of bubbling and fermentation. 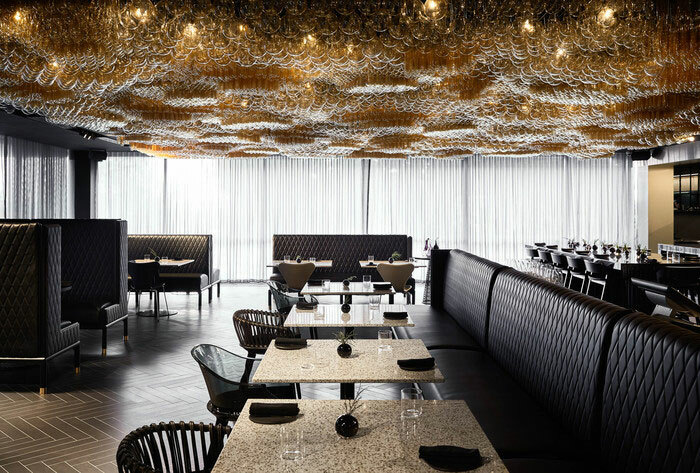 Well-fit as a restaurant design element, it reminds customers what goes on behind the scenes and may well create an appetite right after awing their artistic sensibilities. 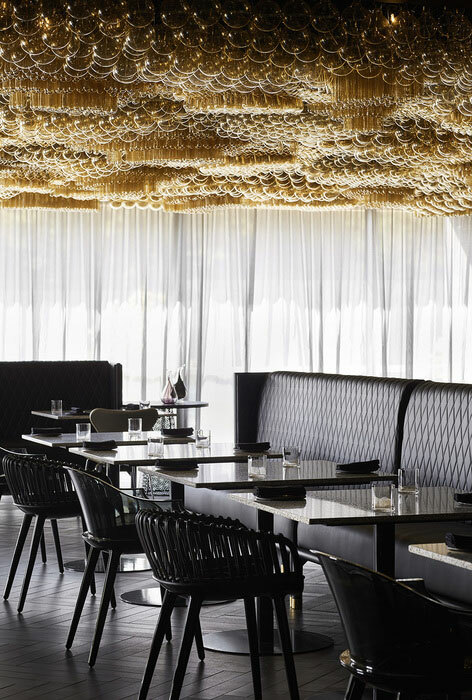 This immense overturned “bubbling” vista creates warmth, atmosphere and a sense of wonder. The restaurant design is modern and elegant, qualities achieved by combining clean lines with a limited chromatic palette. These simple design elements keep the focus on the beauty of the ceiling and provide an excellent background for this unconventional display of light. 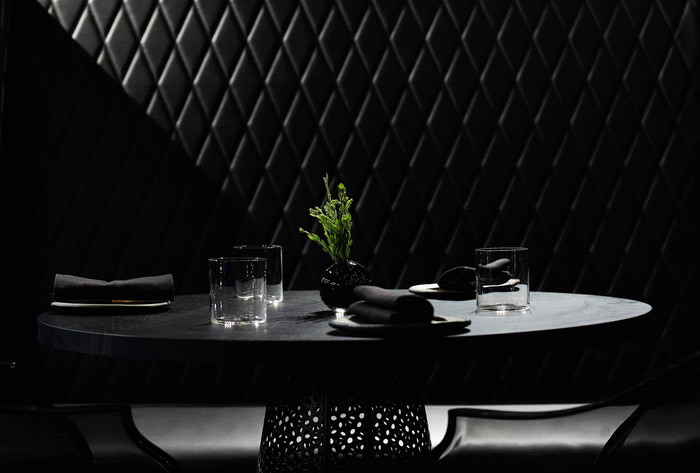 The black padded leather banquettes and black modern chairs bring in a fitting color symbolism. 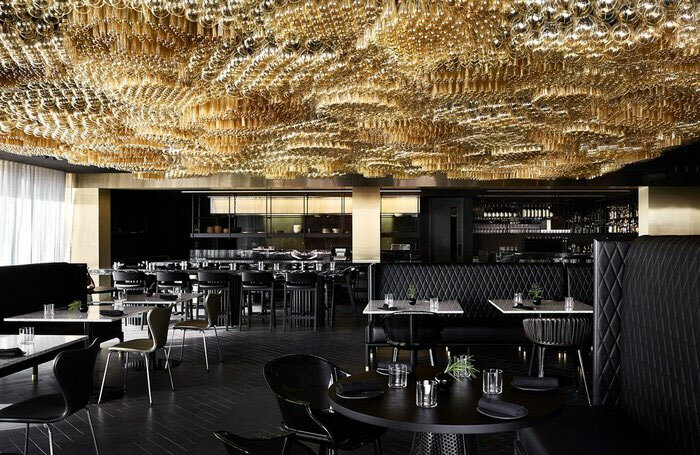 If black is associated with elegance and style, the gold tinges of the 10,000-light ceiling structure suggest glamor and luxury.